Layered materials have much potential for applications as ion exchangers, gas sorbents and catalysts. 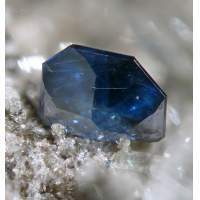 Layered titanosilicates are of particular interest because on the one hand they possess large amounts of titanium and, on the other, they exhibit a wide variety of crystal structures. This chapter summarizes the main structural features in the family of heteropolyhedral layered titanosilicates and presents briefly the synthesis and application studies on some of these materials. The most representative members have been described in terms of the construction of each individual sheet from the individual building blocks. In general, the structures of these materials encompass single layers, mica-type layers (heterophyllosilicates) and perforated ‘microporous’ layers. The most commonly used synthesis process and potential applications of some layered titanosilicates are reviewed briefly. The materials with perforated ‘microporous’ sheets are particularly interesting because they can be considered as microporous materials with one of the dimensions in the nano size regime, meaning the materials have fast transport properties. Most of the structures reviewed are known only as minerals. Both the synthesis and potential applications of layered titanosilicates have been significantly underexplored and still present a great number of challenges and opportunities for future research.